Since the discovery of fire we have been cooking, braising , searing, roasting and barbecuing. Taste has long convinced humanity that preparing a dish in clay outperforms in aromas and taste. 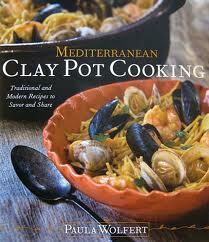 Authoress Paula Wolfert has written a book called Mediterranean Clay Pot Cooking verifying the secrets of earthenware . 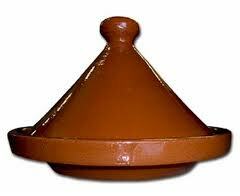 Furthermore The Tagine of Morocco , the Cazuela de Barro of Spain, the Columbian Bean Pot or Olla de Frijoles and the Chinese Sand Pot have been the vessels employed thru out the centuries. What are your views, results, dishes of success and anecdotes. One type of a Puglia, Italia Clay Pot Potato Dish. Look forward to hearing from you. 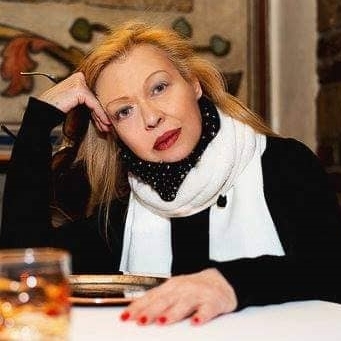 Margi. I spent 18 months anxiously waiting the publication of that book (which came out in 209, btw); and then wrote a glowing review. When I ran the reviews department at Cheftalk, one rule was that a reviewer make at least two recipes from a cookbook. For Mediterranean Clay Pot Cooking I made eight! It was not a hardship. Does that answer your question about my thoughts on clay-pot cookery? If not, my personal collection includes: two tagines, six cazuelas, a variation of a Turkish cooking tile, a Moravian-style redware skillet, and an assortment of casseroles, bowls, etc. Brook. Thanks for ur feedback and informative contribution. The Book Is A Wonderful Addition and especially if you enjoy Medit. cuisines. Margi. On the other hand, you can find some great bargains at garage sales, flea markets, and antique malls. One piece I use fairly often, for instance, is a covered, round baking dish. It was bisque fired, but never glazed. There’s a small chip in the edge of the bowl. But I paid US1.50 for it. So how can you get hurt! One deal I regret is the largish Romertoph I found at a mall. They were asking less than ten bucks. Unfortunately, it was badly stained, and I didn’t know, at the time, how to remedy that. Alas! For those interested, here’s one of the great recipes from the book. A Tiella is a wide, medium-high glazed vessel popular in Calabria and Puglia. 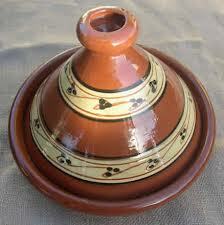 As with tagines, the name is used for both the pot and the dish. A large cazuela or casserole dish will work just fine. Soak the porcini in 1 cup hot water for 20-30 minutes. Rub the mushrooms together to loosen any dirt and grit; then remove them from the water and coarsely chop. Strain the soaking liquid through a coffee filter or double layer of cheesecloth and set aside. Heat 2 tablespoons of the olive oil in the casserole. Add the garlic and pancetta and cook over medium-low heat, stirring, until golden, about 5 minutes. When the casserole is warm, raise the heat to medium, add the pork, and cook, stirring, until lightly browned, about 10 minutes. Add the potatoes, chopped porcini, quartered fresh mushrooms, rosemary, hot red pepper, 1 teaspoon salt, ½ teaspoon pepper, and the reserved mushroom soaking liquid. Cover and simmer over low heat for 45 minutes. (The recipe can be prepared to this point up to 1 day in advance. Bring back to room temperature before continuing. About 1 ½ hours before serving, scrape any fat from the pork dish. Carefully pick out as many potatoes as possible and set aside. Arrange the meat and mushrooms in with layer and top with a layer of the potatoes. Gently press down to make the dish compact. Scatter the remaining tablespoon olive oil and the cheese on top and set in a cold oven. Set the temperature at 400F and bake for 30 minutes. Turn off the heat, and let the dish continue to cook in the receding heat for 45 minutes. Serve hot or warm, with the chopped parsley sprinkled on top. Grazie, Muchas Gracías for posting the lovely Earthenware clay pot recipe from Puglia. I posted a photo of this type of clay earthenware vessel in one of my posts above. All my Kindest for your lovely contributions and feedbk. Photo: Spanish Clay Vessel Oven Earthenware. 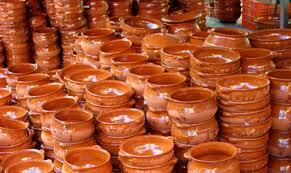 I wish to thank you for your suggestions on where to find reasonably priced clay pots. Flea Markets, or Bazaars ( Zocos or Rastros in Spanish ) as well as Yard or Moving Sales, 2nd Hand Shops are always good places to browse for clay pots. However, just a note to those buying for the 1st time; the older the clay mud combination pots are; the better. They are " SEASONED " and are wonderful to implement Mediterranean slow cooking. When I first moved to Europe in 1992, clay pots of all types & sizes & shapes, were dirt cheap Chollos ( bargains ), however, since the Euro Currency, they have risen in price. The tiny Tapa sized Cazeulas are 1.00 Euro and are the ones you find at the Bars. The large sized roasting clay ovenware run between 4.50 - 8.00 Euro Dollars. The lid varieties can run 10.00 Euros to 15.00 Euros, depending on size. The best places here to purchase are same: the main Sunday morning flea market in La Latina Neighborhood, Moving Sales and the 2nd Hand shops in which one can find a real bargain; as well as the 1 Euro Shops owned by the Chinese. They are labelled MADE IN SPAIN. Great information - thanks for posting! The time will come soon when I can use it - perhaps over the Thanksgiving holiday, or as part of the meal itself? Tas. Veggies are lovely in tiellas or potatoes or in cazuelas. Once a person cooks in clay, the taste shall linger. Enjoy. MC. Tas. Great idea. Enjoy. Margi. I'm sure the book is wonderful, and I mean that sincerely because I have many of Ms. Wolfert's books. That is a gorgeous earthenware .. Perfect for roast chicken or oven dishes ..
As you know, it is my preferred method of cookware .. I have 2, that date back several decades and adore them .. I prepare risottos and paellas in them ! All my best and have a lovely summer ..
Me, too, Bee Jay. But this one belongs at or near the top of the list. In it, she introduced many Americans to clay-pot cookery the same way she introduced them to Moroccan cooking in the early 1970s. Long term, I truly believe Clay Pot Cooking will have a greater impact, over all, that did Couscous and Other Good Food From Morocco. If you have an opportunity to obtain a copy, jump on it! By the by, I've seen photos of Paula's clay pot collection. My eyes turn green every time.